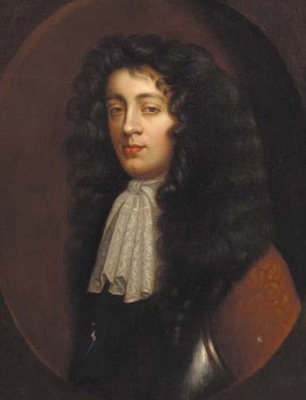 When the succession to the throne was raised, Charles II affirmed that he never married Lucy Walter and deprived the Duke of Monmouth of many of his posts. On the 11 June 1685, Monmouth landed at Lyme Regis in an attempt to sieze the throne. At Sedgemoor, north east of Taunton, Monmouth made an ill-advised attack against the Royalists and was defeated. He was captured in the New Forest a few days later, and executed in the Tower of London on July 15 1685. [S6] G.E. Cokayne; with Vicary Gibbs, H.A. Doubleday, Geoffrey H. White, Duncan Warrand and Lord Howard de Walden, editors, The Complete Peerage of England, Scotland, Ireland, Great Britain and the United Kingdom, Extant, Extinct or Dormant, new ed., 13 volumes in 14 (1910-1959; reprint in 6 volumes, Gloucester, U.K.: Alan Sutton Publishing, 2000), volume II, page 366. Hereinafter cited as The Complete Peerage. [S11] Alison Weir, Britain's Royal Families: The Complete Genealogy (London, U.K.: The Bodley Head, 1999), page 256. Hereinafter cited as Britain's Royal Families. [S6] Cokayne, and others, The Complete Peerage, volume II, page 367. [S6] Cokayne, and others, The Complete Peerage, volume II, page 212. 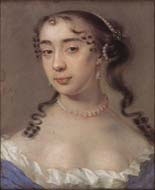 She and Robert Sydney were associated.4 She and Charles II Stuart, King of Great Britain were associated. [S8294] Peter and Roger Powell Beauclerk-Dewar, Right Royal Bastards: The fruits of passion (Wilmington, Delaware: Burkes Peerage & Gentry, 2006), page 21. Hereinafter cited as Right Royal Bastards. Children of Catherine Pegge and Sir Edward Green, 1st and last Bt. [S8294] Peter and Roger Powell Beauclerk-Dewar, Right Royal Bastards, page 23. [S8294] Peter and Roger Powell Beauclerk-Dewar, Right Royal Bastards: The fruits of passion (Wilmington, Delaware: Burkes Peerage & Gentry, 2006), page 41. Hereinafter cited as Right Royal Bastards. [S8294] Peter and Roger Powell Beauclerk-Dewar, Right Royal Bastards, page 42. 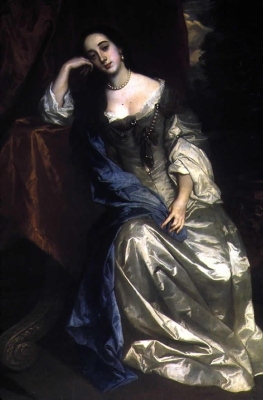 She was also known as Charlotte Jemima Henrietta Maria Boyle.1 Her married name became Howard.3 From 17 July 1672, her married name became Paston. 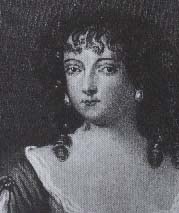 From 24 October 1638, her married name became Boyle.1 She and Charles II Stuart, King of Great Britain were associated circa 1649.2 After her marriage, Elizabeth Killigrew was styled as Viscountess Shannon on 6 September 1660. Her last will was dated 27 July 1680. [S6] Cokayne, and others, The Complete Peerage, volume IV, page 82. 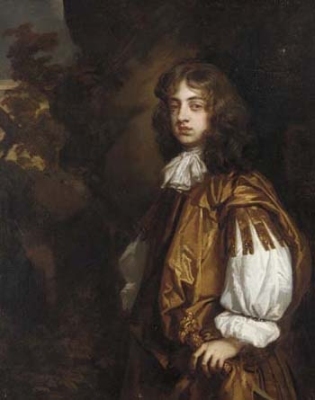 She and Charles II Stuart, King of Great Britain were associated between 1659 and 1668.4,6 From 14 April 1659, her married name became Palmer. 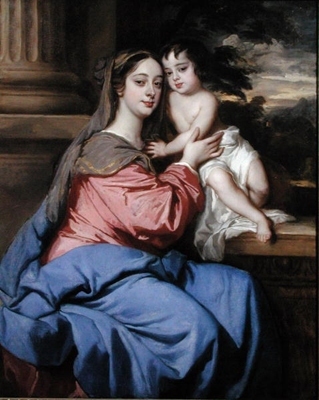 She held the office of Lady of the Bedchamber to the Queen Consort in August 1662.6 She and John Churchill, 1st Duke of Marlborough were associated circa 1668.7 She was created 1st Baron Nonsuch, co. Surrey [England] on 3 August 1670, with special remainder to her eldest son, Charles Palmer and then to her 'second' son, George Palmer.5 She was created 1st Duchess of Cleveland [England] on 3 August 1670, with special remainder to her eldest son, Charles Palmer and then to her 'second' son, George Palmer.1 She was created 1st Countess of Southampton [England] on 3 August 1670, with special remainder to her eldest son, Charles Palmer and then to her 'second' son, George Palmer.5 She held the office of Ranger of Bushy Park in 1677.5 From 25 November 1705, her married name became Feilding.5 Her last will was dated 11 August 1709. [S6] Cokayne, and others, The Complete Peerage, volume III, page 281.